Differential single phase 2 poles (1 + N) 80A 0.03A (30mA) class AC. 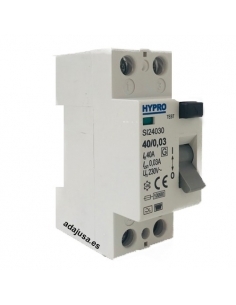 Electromagnetic element, which allows you not to lose protection in case of variation in the voltage input and thus to maintain the protection of the active phase in case of loss of the neutral. Electrical differential protection switch 80A 30 mA, 2-pole, electromagnetic type, for protection of people against insulation / derivation problems in installations or electrical elements. For use in domestic, tertiary and industrial sectors.